We see from this passage that there is a carryover from the context of Chapter Five concerning growing Spiritually beyond the principles of salvation through Christ. We are encouraged to move forward in the growth of our faith beyond the foundational doctrinal principles to a more mature faith. At the same time, this growth will be done, “if God permit,” which tells us that our growth is to be through our reliance on God. Are you grounded in the principles of Biblical doctrine? Do you have an established routine of studying God’s Word, praying, and participating in the activities of a good local church? If not, have you considered taking a Bible Survey or Bible Doctrines course? Much has been written about this passage throughout the ages, but when considering the context, God is very clear as to what He intended to communicate. We are taught that it is impossible for a person who has enjoyed the enlightenment and fruit of salvation, tasted the Word of God and the power of God in their life to “fall away” and be renewed to repentance in certain situations. This is clarified in the situation of those being described as crucifying Christ afresh and putting Him to an open shame. The believer in this case has fallen away. The Greek word used here is “parapito,” which means that they have stumbled. This is the same word used in the word “parapet,” which is a steeply sloped mound of dirt in front of a fox hole that is designed to protect a soldier. The enemy must overcome this upward slope of dirt that is designed to make them stumble so that they cannot easily get to the soldier in the fox hole. Theologically, this presents the idea of a believer that has stumbled, but because they are not repenting of their sin, they cannot be renewed in their blessings of growth by God. Instead, they put Christ to open shame by not dealing with their shortcomings before God in the right way. 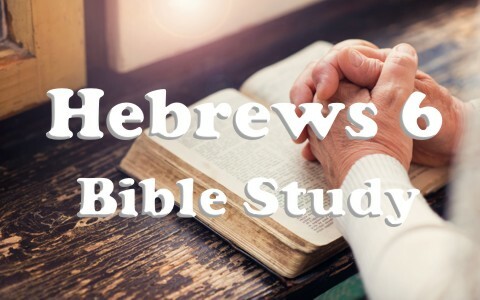 In the case of the Hebrews, they were either doing nothing about it or going back to the Temple to offer a sin offering, which was no longer acceptable by God (Galatians 5:1-6; Hebrews 10:18-26). Instead, God wants us to deal with it by repenting, confessing, and doing what God wants us to do (James 1:16-25). Have you experienced the joy of salvation in your life? If others that know you were asked, do you think they would say that they have seen Spiritual growth in you? If not, is there something in your life that needs to be forsaken so that you can grow in your faith and walk with the Lord? Have you confessed your sins to God and others that may have been involved and asked for forgiveness? We are given an example here of how all the vegetation on the earth receives water from rain to grow. Some vegetation grows to be profitable for eating and a blessing. However, other vegetation will grow to be unprofitable and of no use. This vegetation will not be profitable for any growth in anyone and in the end of days, will burn up with the earth. This also paints a picture of our deeds as believers that “accompany salvation.” More specifically, it teaches us that our deeds, good or bad, will be evaluated one day and will result in “blessing from God”: or result in being “nigh” (close) to being cursed or burned up. This will take place at the judgement Seat of Christ (1 Corinthians 3:1-15; 2 Corinthians 5:1-18). When you look at your life, which activities in your life result in eternal blessings? Likewise, which activities in your life do you think will have no eternal value or blessing from God? Is there anything in your life right now that you regret in light of your salvation? Is there anything in your life that you would not want revealed at the Judgment Seat of Christ? Here we are told that God will not forget about the work we did because of our love for Him and our neighbor. We are encouraged to use the time that God has given us to demonstrate the hope that lives within us that the promises that God has made to us and others before us will be fulfilled. This work does not end until the day that God calls us home. Do you use the time effectively that God has given you to do the work of God and for the benefit of His kingdom? Do you regularly devote time to helping in the ministry efforts of your local church? Have you personally helped anyone else to grow in their faith and walk with the Lord? We are encouraged by reminding us of the promises that God made to Abraham. Because of these promises we can have hope that God will keep His promises to us. This is because we are children of God through our faith. Likewise, we also become children of Abraham and heirs to the promises that God has made to him (Galatians 3:6-9; Galatians 3:26). Finally, we are told that these promises were confirmed to God by His Word. Because of what Christ did for us, He is our hope of salvation and hope for rewards of blessing in our life in eternity (Colossians 1:27; 1 Timothy 1:1; Titus 2:13). What blessings did God give to Abraham? What is your hope for others? There is much more than can be said about Hebrews 6. However, if you do some additional studies about hope, the Judgment Seat of Christ, and follow up passages later in Hebrews, you will be blessed by the depth of God’s love and provision for us. Finally, it is comforting that although we will stumble in our walk with God, we can continue to receive the full blessing of God as we seek His forgiveness and will for our life.